The Trowup Burn rises high on the steep slopes of Black Hag little more than the toss of a haggis away from the Scottish border. It is a shy little burn of just over 5 kilometres in length set in a deep narrow valley and surrounded by some of the finest grass-carpeted ridges you are likely to stumble across on a single days walk. Dominating the head of the valley, The Curr has its feet firmly planted on Scottish soil and offers outstanding views of the Cheviot heartland along with a multitude of seductive border hills. 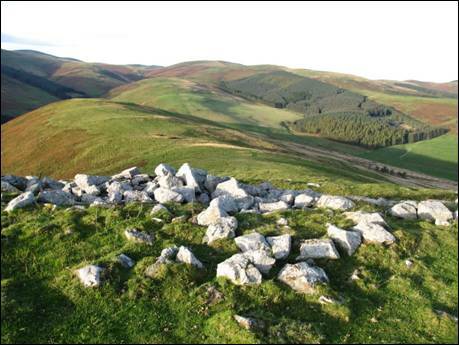 As you set out on this rollercoaster walk from the tiny hamlet of Hethpool in the beautiful College Valley you will have the hillfort-crowned summit of Great Hetha firmly in your sights. Barely into your stride, your heart rate will increase and your lungs will expand as you make the short but sharp climb to the top of this fine 343 metre high hill. Soon after descending to the isolated farmstead of Trowupburn, you will be heading up the magnificent Shorthope Shank towards the flat summit of Saughieside Hill before then making tracks to The Curr via peat-puddled Black Hag. Your return route initially follows the Pennine Way over Steer Rig towards the windswept top of White Law. Once back on English territory, a pleasant green and undulating track will ultimately deliver you to the base of Great Hetha and the start of your second visit of the day to this inspiring little hill. As you stand once more next to the summit-topping walker`s cairn you will be delighted to be back again. From here it is all downhill. 1. Described by Geoffrey N. Wright in his 1989-published book, `The Northumbrian Uplands` as, “Pleasant, unspoilt, remote valley penetrating southwards from Glendale into the Cheviot Hills, served by a single-track road beyond Hethpool”, the College Valley is indeed a Northumbrian gem. The tiny hamlet of Hethpool snuggles up at the feet of Wester Tor, The Bell, White Hill and Little Hetha in what can only be described as an idyllic setting. It boasts the remains of a 15th century pele tower, an attractive row of Arts & Crafts style cottages and the 1919-built Grade II Listed Hethpool House, once home to ship owner and philanthropist Sir Arthur Munro Sutherland. It also lies on the route of St. Cuthbert`s Way and is the perfect place to start a walk. Once you have entered the valley and have passed, on your right, the picturesque row of cottages make your way across the cattle grid and turn left into the small car parking area (GR NT894280). The valley and much of the surrounding hill country is part of the College Valley Estate and the Board of Directors, “have a duty to manage it in a way that increases its value as an environmental, social and economic place of excellence and, in doing so, they strive to encourage and make available to the general public an environment that focuses on education and recreational enjoyment. Whilst farming and forestry underpin the estate's financial viability, the directors do look at other enterprises which are in line with the objectives and aims of the Estate.” Cars are not permitted beyond this point without a permit. Enough of this chit-chat, it is now time to get down to some serious walking. So, suitably kitted out for a day in the hills, head off along the valley road passing as you go, in the unfenced grass field to your right, what little remains of the `stone circle` which is thought to have stood here since the late Neolithic period (4000BC-2200BC). All around the views catch the eye with the superb dry stone wall, on the opposite side of the College Burn, heading steeply towards rugged Wester Tor looking particularly impressive. Soon, on your right in front of a small plantation, you will see a signpost indicating, ` Great Hetha ¾` and this is your route upwards. So, leaving the tarmac behind, follow the thin path as it turns around the edge of the plantation and begins its steady climb towards the top of Great Hetha. Quickly you will reach, at the top end of the trees, a small saddle where, to your right, there is a pleasant view. At this point you will need to turn to your left and head uphill. Whilst you are following what is marked on the Ordnance Survey map as a `permissive path` this is `access land` within the Countryside and Rights of Way 2000, so do not be concerned if you wander slightly away from the defined route. The occasional marker post and the clear quad track should help you along the way. As the gradient eases you will see in front of you Great Hetha`s summit-marking walker`s cairn (GR NT885274) and an outstanding panorama. 2. You are now standing in the middle of one of the most impressive Iron Age hillforts in the College Valley area and many of the stones which made up the extensive ramparts still lie where they were first placed. When you have finally soaked up the views and you make your way across the top of the hill, in a south-westerly direction, to begin your descent towards Trowupburn you will pass through a substantial number of these stones. Continue to head over the grass-covered ridge following, as best you can, the intermittent quad track and when the hill starts to fall away you will spot a cluster of trees below you. Aim slightly to the left of these trees and, as you arrive at the bottom of the slope, you will see ahead a small, fence-crossing stile. Once on the other side, turn to your left and wander down the narrow, tarmac-surfaced road to the white-walled, mid-19th century farmhouse of Trowupburn. Keep to the right of the buildings to join a public footpath which, to your left, crosses the Trowup Burn and, to your right, heads as a rough track above the burn in a south-westerly direction. This is your route. As you continue forwards ignore the track which soon turns diagonally uphill through a section of gorse. Your way is straight on keeping parallel with the burn, now lying below you to your left. In a short distance, where the Shorthope Burn joins the Trowup Burn, you will arrive at a shallow ford (GR NT871261) which you must now cross. After splashing your boots through the ice-cool water, skirt around the western end of the sheep enclosure and, then, climb straight up the facing grass slope. You are now beginning the muscle-teasing climb up Shorthope Shank, a journey which will eventually take you to the 487 metre (1598 feet) high top of Saughieside Hill. Along the way you will be guided by a very helpful quad track as you enjoy superb views across the valley of the Trowup Burn to the border ridge. It is worth pausing, in case you needed any persuading, to look back over your shoulder as you head relentlessly upwards. The view to Great Hetha and the retreating army of green, rounded hills is quite simply breathtaking. A small cairn, part way up, makes the ideal place for an intake of breath. 3. Presently, after the track has turned towards the south-east and the climbing has come to an end, you will need to temporarily leave the security of the track and head off to your left to claim the summit of Saughieside Hill (GR NT868249). Whilst, at first sight, it appears difficult to establish where the true top stands the keen-eyed walker will spy a lush green patch of turf in the middle of the huge area of corn-coloured grass which covers the majority of this rounded hill. This patch of turf is your target and, once reached, the highest point can be easily established. Much of the view is obscured by the vastness of the summit area although there is a tantalising glimpse of Black Hag and The Curr to the south-west. This is perhaps a summit for the record rather than one for pure enjoyment. Now return to the quad track and continue your journey south-easterly, following the useful track downhill towards the saddle between two feeder watercourses, one into the Trowup Burn and the other into the Whitehall Burn. 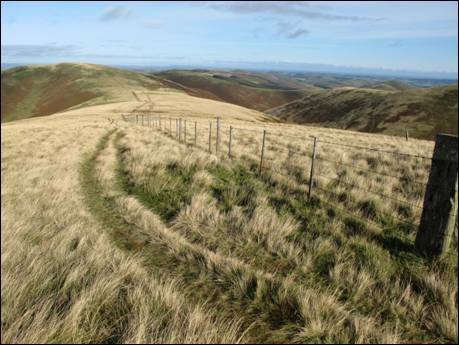 As a consequence, the area can be a little boot-squelching as you head across the saddle and climb towards the post and wire fence which will ultimately lead you to Black Hag summit. 4. Once the fence is reached you will need to continue in a generally south-westerly direction, with the thin line of the fence, along with a second strand of fencing slightly behind, firmly on your left. After a gentle uphill stretch, which reaches its zenith at 528 metres (1732 feet) above sea level, the going is relatively flat although, at times, it can be a wee bit boggy. No matter, it is a fine walk with good views across to The Schil and beyond. Eventually, as the underfoot conditions become much drier you will arrive at the 549 metre (1801 feet) high top of Black Hag at the point where there is a pronounced kink in the boundary fence (GR NT861237). Ahead, the domed top of The Curr is now clearly in your sights. Stay with the fence and in less than 100 metres you will reach the post and wire fence which marks the English/Scottish border. You must now cross over into Scotland and, as the top strand of the fence is barbed wire, this can be a slightly tricky manoeuvre. So take care and be sure to avoid damaging the fence. Now nicely on Scottish territory, and with your back to the fence, make a bee-line and pathless decent towards the route of the Pennine Way passing along the way the prominent mass of Corbie Craig. It is worth stopping here to take in the view which covers a multitude of border hills along with the valley of the Rowhope Burn. 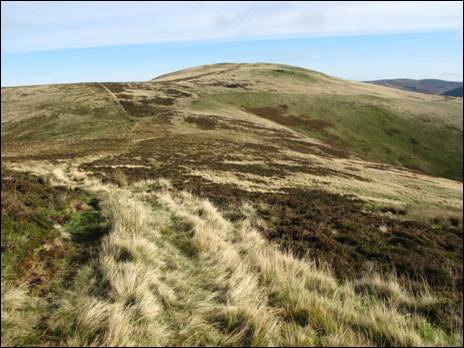 On reaching the green track at the bottom of the slope, turn right and you will almost immediately arrive at a three-fingered signpost indicating, ` Windy Gyle 8¼ Kirk Yetholm (high level route) 4½ Kirk Yetholm (low level route) 4` all via the Pennine Way. Initially you will be following the low level route as far as the next gate at which juncture you will have to turn off the well-beaten National Trail by heading downhill to your left. This is the start of your climb to the summit of The Curr which follows, through a mixture of rough grass and cropped heather, a winding track which keeps slightly to the left of the uphill heading post and wire fence. Eventually, when the gradient eases and the track begins to bend off to your left, away from the fence, it is time to turn half-right and to aim for the junction of two fences beyond which you will soon spot the summit-topping triangulation pillar. The only barriers now between you and the 564 metre (1850 feet) high top of The Curr are two fences and these are easily crossed. 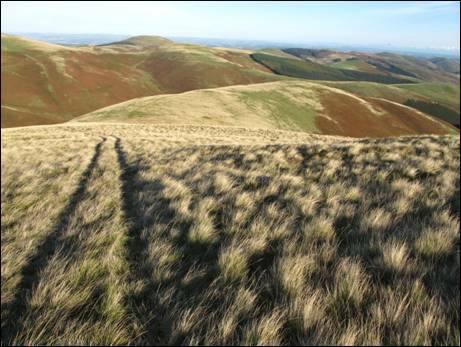 The view from the pillar is slightly obscured by the large expanse of the flat summit area although the upper parts of The Schil and The Cheviot can be seen in all their glory. A more thorough exploration of the summit will, of course, reveal much more besides. 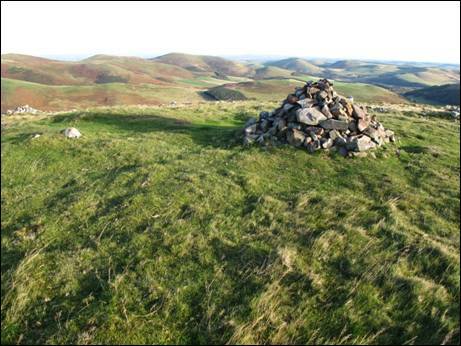 The next nearest triangulation pillar stands on Staerough Hill some 4.4 kilometres away on Scottish soil whilst the nearest `English` pillar is 6.5 kilometres away on The Cheviot. 5. Perhaps you will enjoy a spot of lunch at this remote and lonely place. When you are ready to be on your way, retrace your steps as far as the gate through which the low level Pennine Way route was about to pass as you began your journey to the summit of The Curr. Once there, do not follow the Pennine Way in either direction. Your route now heads straight uphill with a fence on your left and the faint indentations of a quad track to keep you on the right course. At the top of the slope you will join the high level route of the Pennine Way which, after passing through a gate on your left, heads towards Steer Rig. This is the way forward. In his 1926-published book, `The Border Line`, James Logan Mack said that from here onwards, “there is little of importance to note, with the possible exception of a curious outcrop of shattered rock, otherwise the watershed rises and falls by gentle gradients with extensive views on either hand.“. There are certainly far-reaching views and this stretch of your walk is arguably the finest of the day. As you wander along this magnificent ridge towards White Law there will be a host of landmarks that catch your eye. “To the west, away down in the valley”, wrote James Logan Mack, “lie the remains of a cottage of Old Halterburn”, adding as a footnote that, “this cottage is in ruins not by reason of its age, but on account of the fact that the roof was blown off in a storm and not replaced”. The ruined cottage of Old Halterburnhead still stands and, as you make your way ever onwards, this is something you may wish to watch out for. 6. Eventually, at a height of 350 metres (1148 feet), you will reach the lowest point of the ridge and the steep, grass-coated slope of White Law will be lying in wait. You are about to climb 80 metres (262 feet) in height in just over 500 metres of distance, and, whilst at first glance this might seem like a drop in the energy ocean, be prepared for a little bit of heavy breathing and a degree of sinew-stretching. As you head upwards, be sure to occasionally break your stride as the view back over your shoulder to Steer Rig and The Curr should not be missed. You will be relieved when you finally reach the 430 metre (1411 feet) top of White Law which incidentally lies just over the border fence close to the small gate. This spot enjoys one of the finest locations in the Cheviot Hills and should be savoured. When you ultimately decide to drag yourself away from this grandstand viewpoint, you will need to pass through the small gate onto English territory and to follow the track downhill through acres of white grass to Wideopen Head (GR NT861265). Ahead stands Madam Law, a hill for another day. 7. With little more than 4 kilometres still to walk and a meagre 132 metres (433 feet) to climb, you are now well on your way to the end of this walk. So, with the fence and gate to the left, turn to your right and follow the clear track which clings to the side of the grass and bracken-covered slope. Below you, to your right, lies the oddly named Wide Open, a barely visible watercourse which merges with the Trowup Burn a short distance downstream. Stay with the track as it heads across superb grasslands, neatly cropped by grazing sheep, first crossing the left hand slope of a small rise and then cutting across the top of the next slightly lower rise. As you go, be careful not to be lead astray by any side tracks and to keep your focus on the more than obvious form of Great Hetha pretty much straight ahead. Eventually, as you top the second rise, you will see a fairly substantial cairn (GR NT874267) in front of you and this lies on your onward route downhill to the tarmac, Trowupburn-serving road you wandered along earlier in the day. Once on the road, turn half right and head across to the small stile you crossed a few hours ago. Now retrace your footsteps uphill, picking out your preferred route and following when you can the sometimes intermittent and faint quad track. In time, you will once again pass through the stone ramparts of the hillfort and find yourself standing next to the walker`s summit-topping cairn. Whilst the view may still be the same, the light will inevitably have changed and landmarks not spotted in the morning may well now be seen. Now leave the summit by your outward route, guided by the occasional marker post, and soon you will once again be standing close to the top end of a roughly triangular-shaped plantation (GR NT888276). Rather than return exactly the same way as you came, go through the small right hand opening in the facing dry stone wall which may involve you in ducking under a wire which sometimes stretches across the gap. Once safely on the other side, walk straight ahead with a dry stone wall on your left. This is a lovely finale to your outing offering you excellent views of the College Burn and those towering twins, Easter and Wester Tors. When another plantation is reached, turn right and trundle downhill to your patiently waiting car. Now to plan your next trip! Generally good paths & tracks which are, in the main, easy to follow. A number of steep ascents & descents. Very little tarmac. Wooler Youth Hostel. Telephone 01668 281365. Small hotels & guest houses in Wooler & two caravan parks/camp sites.